January | 2014 | Mike Lamberti, From Margate To Cleveland, And Back ! They came from far and wide on a dreary January afternoon to say goodbye to the man most in Wayne knew as ‘Goldy’. 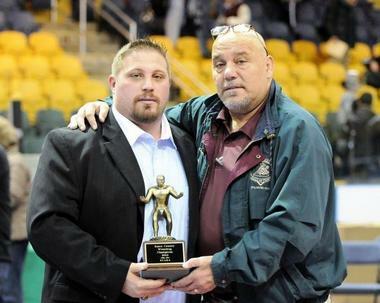 Jon Goldstein’s sudden passing on Jan. 28 has left a void at Goldy’s beloved Wayne Hills High School. So when we all gathered at Temple Beth Tikvah in Wayne on Jan. 31 to say goodbye, it was no surprise that Goldy’s funeral was attended by hundreds, including a vast part of the Wayne Hills student body, football players wearing their game jerseys, as well as an extended family and a lot of grateful friends. There was laughter and tears. There was smiles and angst. There were tears of sorrow and tears from laughing extremely hard. We learned about the Goldy Calendar and the many women who loved Goldy, but lost. We learned about Goldy’s meticulous record keeping when it came to fantasy football. We learned how Goldy was a nut about baseball statistics. We learned about Goldy’s first encounter with legendary football coach Chris Olsen, some 19 years ago. “I invited him to come to a game,” Olsen said to the large crowd. “So it’s game day and I’m getting ready. I turn around, and Jon is standing next to me. He says ‘I’m here’. I said, good, now get back a little, please. Jon’s older brother spoke of Goldy’s love of Wayne Hills. One of his dearest friends spoke of Goldy’s dominance at the local poker games. In fact, if Goldy couldn’t make a game, generally that week’s contest was postponed. (And we learned to spell Goldy, correctly, because Jon wouldn’t stand for any other version). Jon loved to eat. He would often lay out his planned lunch in near-perfect detail, or describe, in earnest, what he just ate. He loved the Wendy’s ‘Baconator’. When he ordered dinner at the local ‘Outback’, it was an event watching him plan his meal. When we would go out on our Thursday nights with the football staff, everyone wanted to see what Goldy would eat. We learned how Jon loved books. And I’ll tell you a secret. 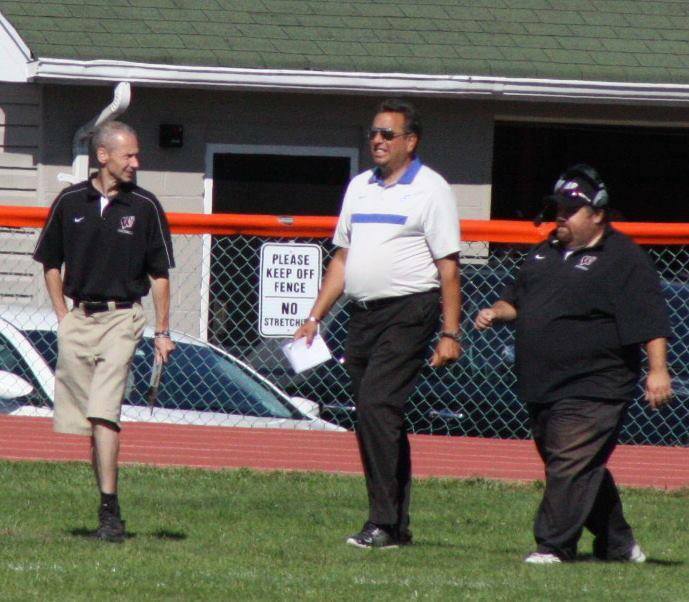 Jon and I had discussed writing a book about the Wayne Hills football program. We had begun talks about it last winter. Now, it will be difficult to carry out that assignment without the Big Guy, but somehow, I will try and make that work. We learned how Jon continued giving, after he left this earth, by being an organ donor and leaving his corneas so that someone else can see the world, hopefully the way he did. What we didn’t learn, because it was long ingrained, was that Jon Goldstein was as loyal to Wayne Hills as the day was long. He may have graduated Wayne Valley, but he was a Patriot, through and through. And, as Olsen said at the funeral, Jon may, physically, no longer be with the people he loved the most, but his spirit will never die. It will seem weird later this year, when football activities begin anew at Hills and not seeing Goldy. There were so many memories of Goldy on that football field. There was the time in 2011 when a Ramapo football player purposely ran into Goldy on the sidelines. Before Goldy knew what hit him, a pair of Hills players were defending their guy. In 2013, a Tenafly player accidentally ran into Goldy on the Hills sidelines. Yes, Goldy, you are fine. And you are in a place where being happy and content will last an eternity. You’ve earned it, pal. A lot of us here will not quite know how to handle not seeing you on the football field, but we know you’re watching out for the Patriots. Take care, have a Baconator and enjoy your new life. There are so many ways to describe the late Jon Goldstein. He was all of the above, but even more, ‘Goldie’ loved the ‘W’ that stood for Wayne Hills, The Brand, if you will. 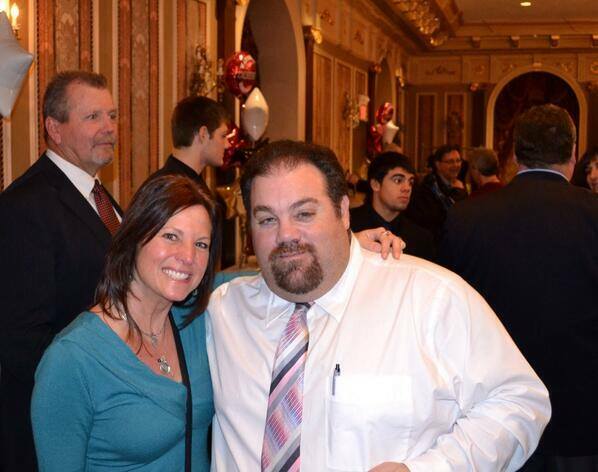 Jon Goldstein, here with Carla Huntzinger, at a Wayne Hills football dinner. The affable Goldie died suddenly on Jan. 28, 2014. 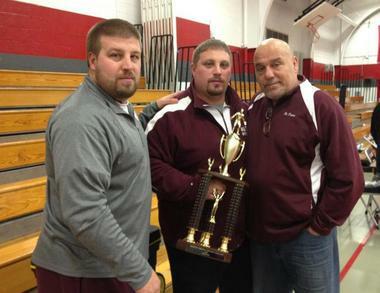 Many knew Jon as the long-time assistant football coach at Wayne Hills, especially during the incredible run under then-head coach Chris Olsen. Jon joined Olsen’s staff as an assistant coach in 1995 and later became an administrator in the athletic department at Hills, a position he held until his untimely death on Jan. 28, 2014. Jon was just 41 years of age. Just moments after I got the phone call about Jon’s passing, my phone rang, and it was Olsen, who now lives in North Carolina. Olsen was planning to travel to New Jersey sometime today. Goldie’s loyalty to the Hills athletic programs were well-defined. In addition to football, he was also the assistant boys basketball coach and the head golf coach during the spring. In 2013, Jon lead Hills to a Passaic County championship in golf and was later tabbed the county’s Coach of the Year. 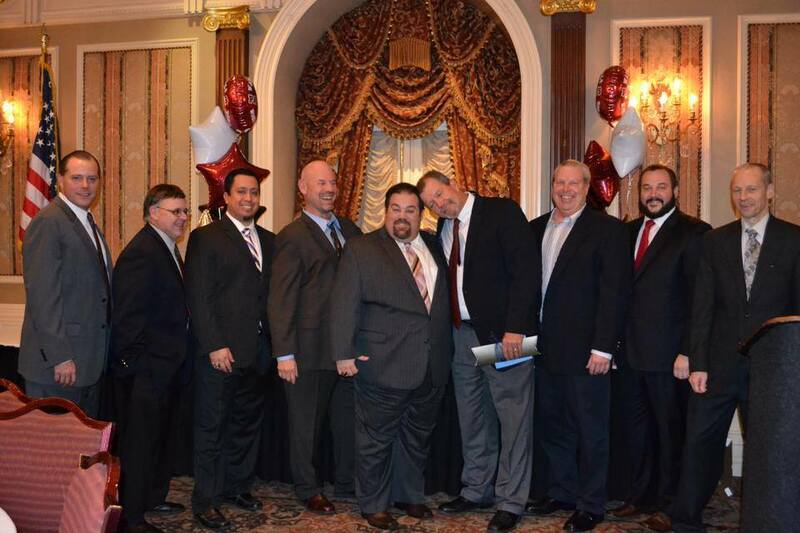 Goldstein (center) is flanked by Wayne Hills football coaches (l to r) Wayne Demikoff, Ted Sobota, Mike Kelly, Claudio Canonaco, Chris Olsen, Walt Johnson, Matt Bogert and Pat Cosgrove at a past football dinner. I first met Jon in 2011 when I spent five days with the football program as it prepared to play arch rival Ramapo. He was friendly, yet guarded, always looking to preserve The Brand. As Jon and I got to know each other more, we developed a nice friendship. Another time, I was walking from the field to the locker room and suddenly, I heard his golf cart pull up behind me. Goldie was a fixture in that golf cart, one that originally belonged to Olsen, but later became his personal carriage as he toured the facilities. Jon was not just an assistant football coach and administrative assistant at Hills, but he was also ‘Head of Football Operations’, as described by current head coach Wayne Demikoff. And most of the other coaches would concur. He was The Man. When Wayne Hills held a seminar for its football program last June, discussing the importance of preparation and leadership, it was Goldie’s talk to the players who would make up the 2013 team, which resonated the most. Jon Goldstein wore the W for nearly 19 years. He may have graduated from Wayne Valley High and lived in Woodland Park, but he was Wayne Hills, all the way. When Olsen had to deal with distractions during the 2011 NJSIAA playoffs, it was Goldstein who deflected a lot of the nonsense. When Olsen retired, it was Goldie who emceed a dinner to honor the legendary coach. When Wayne Hills won the 2011 state title, despite the loss of 10 starters, there was a moment that not many saw, but I did, in the tunnel of MetLife Stadium, long after the game had ended. Goldstein, ever the loyal soldier, countered. Goldie, your family and friends would probably want to echo your words about you, today. Thank you, Jon. We’ll miss you. That was 19 years ago. Today, DiPiano (Big D to his friends) is beginning the 63rd year of his life. What changed the course for this man? 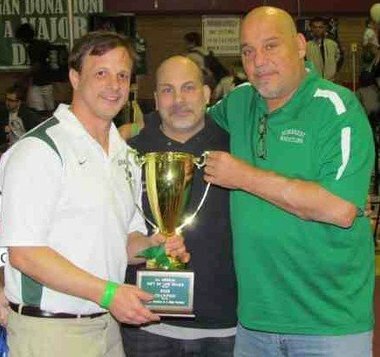 DiPiano’s new lease on life will be recounted at the fourth Gift of Life Wrestling Duals, set for this Saturday at Northern Valley-Demarest High School. With a wrestling theme of ‘Organ Donation is a Major Decision’ as a backdrop, there will be eight teams competing, including the host school, Demarest, which is coached by DiPiano’s eldest son, Mike, Nutley, coached by youngest son Frank, along with Delbarton of Morris Township, Garfield, Montville, Bergenfield, Lenape Valley and Robbinsville. Mike DiPiano and youngest son, Frank, after Nutley won the 2012 Essex County Tournament championship for the first time in school history. Frank is Nutley’s head coach. Wrestling begins at 9:30 a.m. with the finals set for approximately 3 p.m. This is the first year that the Duals will be held at Demarset after being contested at Nutley High since the inception in 2011. On the surface, DiPiano is a hard-nosed individual, a man’s-man who takes no prisoners, so to speak. But he has no problems expressing his emotions on this subject. He recalls attending the first Transplant Games, for those athletes who are recipients of organ donation, in Minnesota nearly seven years ago. “I just hope I can meet his mom one day and tell her that.” Mike DiPiano hosts an annual Christmas party at St. Barnabas in Livingston for children who have undergone organ transplants.